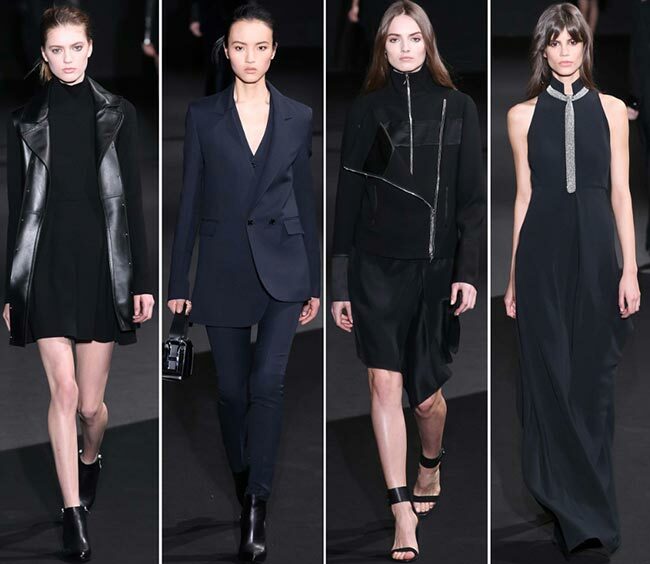 Ennio Capasa has brought to us a rather lovely Costume National fall/winter 2015-2016 collection, fresh off the Milan Fashion Week runway, with lots of black and grey and a whole lot of chic sophistication. 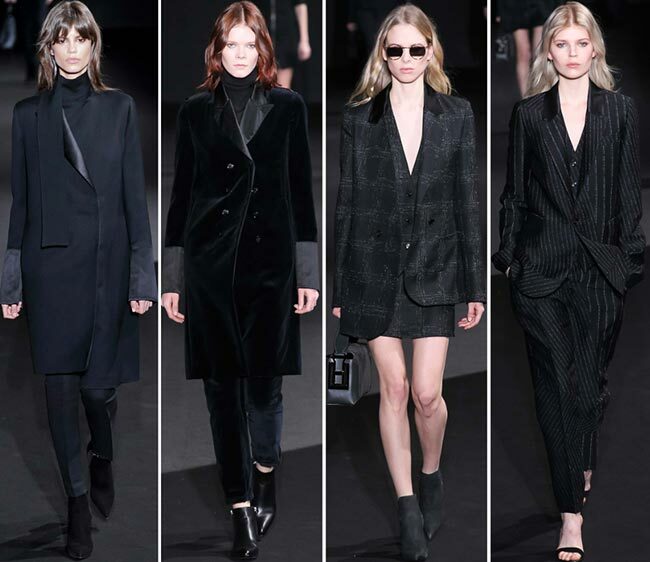 Technically the whole collection is in black, with some pieces featuring some white lining or dark grey hues. It is the only collection up to date that doesn’t have any form of color, not even a tiny splash or sliver. It is, without a doubt, the most sombre of the fashion shows seen over the last month, from the New York Fashion Week to the London Fashion Week and now amongst the shows presented in Milan. We expect that we won’t even see it among the Paris Fashion Week coming up. Then again, it is quite suitable to the brand Costume National, founded in 1986 in Milan and catering to ready to wear, accessories, eyewear, footwear, and perfume needs of women everywhere, as well as men. The first womenswear collection was presented that same year, while it was in in 1991 that “The Woman Collection’ was staged in Paris. One of the major characteristics that sets Costume National apart from the rest of the fashion houses is its focus on eco projects as well, with a solar panel equipped bag appearing in 2009 to charge up mobile phones, and other digital accessories and its “Plant a Tree’ project that is an ongoing feat. 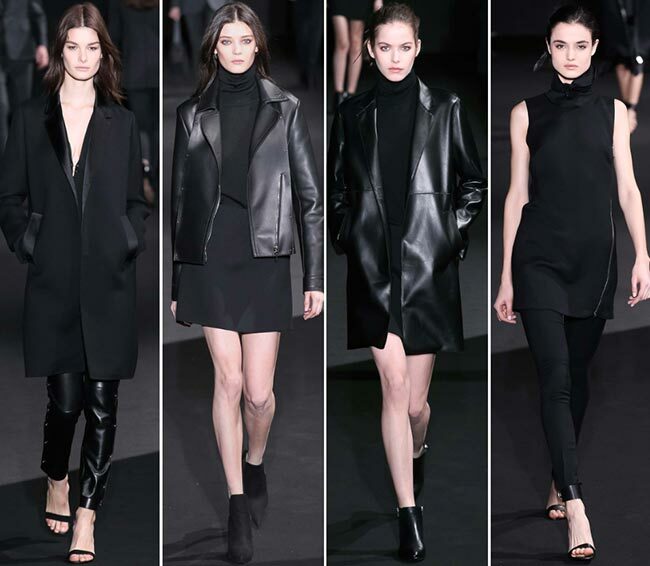 The pieces showcased on the runway but a few hours ago featured so many of the latest trends, including the center slit appearing on 2 of the outfits, with a high slit up the thigh to the side on the final piece of the show; we saw the deep plunging V necklines of the 2015 fashions on a few pieces, while the asymmetrical skirt hemlines certainly made their own appearance. While we had mini length skirts instead of the trending midis and tight fitting pants instead of the looser styles we have gotten used to seeing to date, the ensembles looked rather amazing no matter what style they boasted. We had lots of leather, but also some cashmere and even velvets making the list, while satin lining seems to be quite a common thing in this particular collection. It was nice to see belted fur coats among the mix as well and we do believe we caught a glimpse of ostrich feathers as well. As for the footwear, it’s prudent to note that we had everything from lovely suede pieces to whining black leather ankle huggers, simple booties and strappy sandals. We even had a leather and suede black number covering the feet of the model with the center slit dress, the boots coming up to mid-calf. This is one gorgeous collection full of the little black dresses that we all covet. It is also full of styles that will look amazing on the red carpet as well for those looking to wear something less extravagant and a lot more interesting in a simple kind of way. We loved it!